Skylake all-rounder. The popular UX501 series gets Skylake, DDR4, USB Type-C with Thunderbolt 2.0, and a few other minor changes. Is this a vast improvement over last year's Haswell model? So, what do we think of the Zenbook Pro overall? Well after taking into all of the considerations mentioned above (high-end specifications, extra numerical keypads, lightweight and solid design). We think that it's best served for customers who travels often and wants a balance between work and play (and video editing), which is why the Zenbook Pro is perfect for them. Asus' 15.6-inch desktop replacement delivers plenty of bang for the buck. Apple MacBook Pro and Dell XPS 15 shoppers should take note. Of course, another factor in your buying decision will be whether to wait for a refresh of this refresh, with both Intel and Nvidia having unveiled next-generation silicon in the past few weeks. 80% Asus ZenBook Pro UX501VW review - sharper than a MacBook Pro? The Asus ZenBook Pro UX501VW is a highly capable premium laptop, but it does come with a few noticeable drawbacks. Not only does it have a rather flawed display, but its performance isn’t as good as it could be either. Still, it is around £200 cheaper than the similarly-specified Dell XPS 15 and 15in Macbook Pro, making it an attractive alternative to its high-end competitors. The ZenBook Pro UX501VW has a tough but attractive design and offers blistering performance and 4K visuals at an affordable price. This is a laptop that should be worthy of your consideration. At first glance, the 15.6-inch Asus Zenbook Pro UX501VW-DS71T looks virtually identical to the well-reviewed Asus ZenBook Pro UX501J-DS71T, and it has the same $1,499 (as tested) list price. But on the inside, it's a different story. The UX501VW has an upgraded processor that yields better performance, and its battery lasts 7 hours longer than last year's model. It doesn't quite beat the Dell XPS 15 Touch (9550)$1,949.99 at Dell, our current top pick for high-end desktop-replacement laptops, on overall performance and build quality, but with a price that's more than $600 less, it's certainly worth considering. 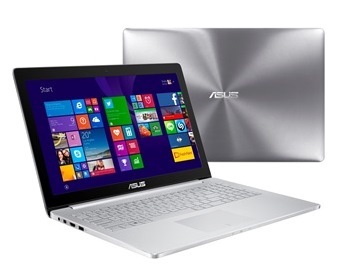 There’s no doubt the Asus ZenBook Pro UX501VW-FJ098T is a seriously expensive laptop. However, taking into account the quality of its screen, its 2D and 3D performance and battery life, it gets almost everything right. If you’re after a super-premium laptop then your choices boil down to the Asus, the MacBook Pro or the Dell XPS 15. The Asus isn’t quite as beautiful as the Apple laptop – and Windows still can't match OS X for high-DPI scaling and touchpad gesture support – but the UX501VW is around £500 cheaper than the Mac for the equivalent specification. There’s a lot to like about the Asus Zenbook UX501VW-DS71T. The laptop is a real bruiser, meeting the competition toe-to-toe and coming out the winner as often as not, despite a price tag that’s hundreds less than similar competitors from Apple and Dell. We don’t normally expect a $1,500 laptop to deliver performance at the head of its class. The Asu ZenBook Pro UX501 is a laptop that looks great on paper, if you’re not turned off by its price. It has plenty of power, high-quality build and an ultra-high resolution screen matched with a touchscreen. And it can even play games. It’s everything many people want in a laptop. However, a few little niggles stop it from being the MacBook Pro 15 and Dell XPS 15 killer you might be hoping for. First, the screen’s dated architecture limits the impact of the high resolution in most environments. It’s incredibly reflective on two different levels. I'm still trying to find the source of Asus' black magic that permitted the creation of a $1,499 machine that rivals the best from Dell and Apple but at a fraction of the cost and with nearly zero compromises. A similarly equipped XPS 15 runs $2,130 and has battery life that's an hour and a half shorter, while the closest MacBook Pro config costs a whopping $2,500 and features a lower-res display and no touch screen or Thunderbolt 3. Asus has updated the ZenBook UX501 for 2016 with a USB-C port and Intel's Skylake CPUs, getting you as up-to-date as you could hope while keeping the fancy aluminium construction of last year's original version. The issues surround the bits that haven't really been updated much, really. The way the touchscreen has been applied really deduces display contrast in well-lit rooms and the speakers are quite weedy for a decent-size laptop. 79.39%: This rating is not convincing. The laptop is evaluated below average, this is not really a recommendation for purchase.